A launch angle of 45 degrees doesn’t necessarily give the maximum launch range when drag is present. Typically a lower angle of around 40 gives more range. An Excel calculation sheet is available here . It does simple integration to take into account the nonlinearity of the air drag. Click on the table below to expand it. 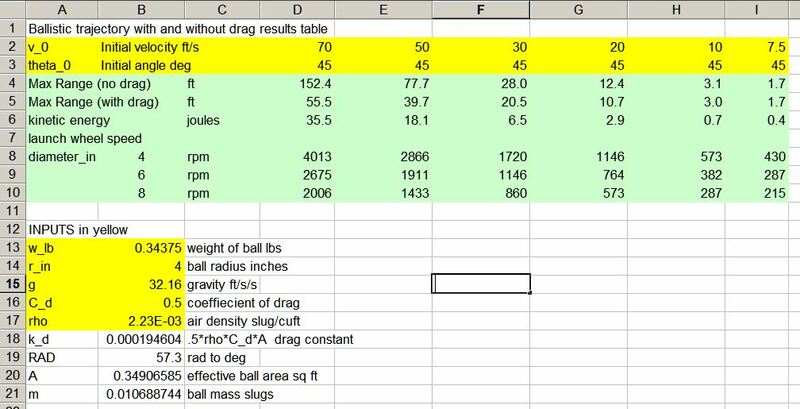 Here is a link to Brandon Gunn 2151 nice Excel trajectory generator. This entry was posted on Tuesday, January 10th, 2012 at 5:27 pm and is filed under FRC. You can follow any responses to this entry through the RSS 2.0 feed. You can leave a response, or trackback from your own site.